Our culinary team can arrange a wide range of options including personalised meals based on your dietary requirements, as well as private BBQs and romantic, candlelit dinners in the privacy of your own villa or other locations around the resort that you’d like to choose. Treat your loved one to a romantic Starlight Dinner, a 3-course bespoke seasonal tasting menu by candlelight under the stars. 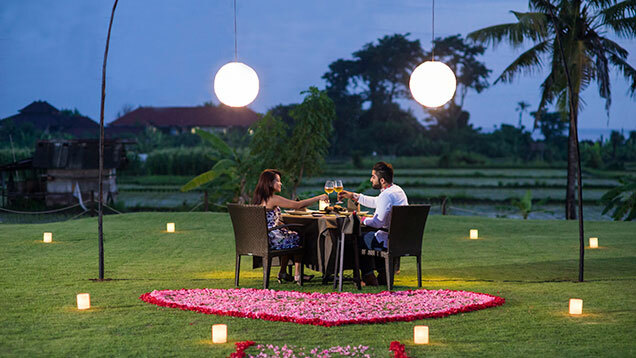 This can be at your villa, on our lawn, by the pool or the rice fields or in other locations around the resort; you can choose. 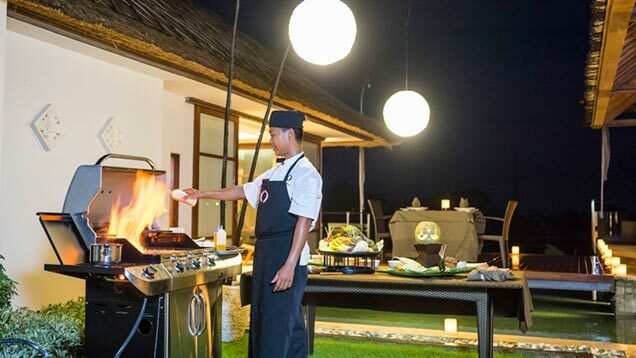 Our culinary team can arrange personalised meals based on your dietary requirements, as well as family and special events where we can offer private BBQ, Buffet, Set Dinner, Indonesian Rijsttafel and more. Our Private Dining focuses on producing culinary delights for families and small groups, and is ideal if you want to celebrate a special occasion such as a birthday, engagement, wedding or anniversay. Our culinary team can arrange personalised meals based on your dietary requirements, and can produce authentic local flavours such as the famous traditional Rijsttafel or 'rice table' menu.